After 100 years of burning fossil fuels the human race is leaving a legacy of depleting energy resources and rising prices to their children. Reducing carbon emissions worldwide by the greater uptake of renewable energy is in all of our interests, as is the conservation of water. The lifestyles we have come to cherish will be dramatically affected by environmental changes. As the worldwide cost of fossil fuel continues to spiral upwards in conjunction with growing shortages, we find ourselves entering the final stage of the global fossil fuel based economy. For the past 18 years, businessman and entrepreneur Mr Eric Hawkins, a well respected renewable energy systems designer has established his name in many countries by first designing a solar collector in 1991, which was followed in 1998 exporting containers of solar collectors from China to first the UK, then to the USA, Ireland and Sth Africa. He returned to China in 2010, to transfer as much of his business experience, system designs and know how to selected Chinese manufactures that have stood out above others looking to incorporate western Qaulity Control and installation standards. The brand name Solar Speed Flex was to be the first stage of a 4 part business plan, to move the level of plumbing installations and quality of materials used to a higher level. 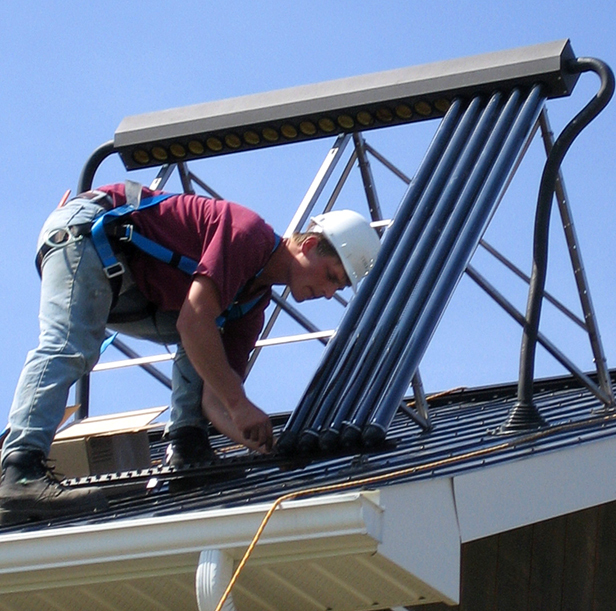 Currently China leads the world in the number of solar thermo siphon systems installed on roof tops across China. The current standard of the plumbing, is cheap plastic pipes with inferior quality brass fittings and low quality insulation tube, which often trails across the roof to an entry point in the all cement roof. This in turn wastes billions of liters of water is every time hot water is drawn from the tap (faucet), as well as millions of KW of electricity wasted. Solar Speed Flex is a high quality all British designed and developed pre-insulated flexible stainless steel corrugated or helical pipe. It is 100% manufactured and assembled in Hangzhou and is offered to the medium and large Chinese solar water heating manufactures in the hope that the overseas buyers can provide a higher adding value and a higher solar plumbing system standard. We must create a balance between what we take out of the natural world and what we put back. Our products can help to redress the imbalance. There are many things we can do to help the environment including installing renewable energy, making sure we don’t leave appliances on stand-by and making informed decisions about the products we buy. When choosing appliances, think of the long term running costs and not just the price tag. Less energy efficient products may be cheaper initially, however A rated appliances will save you money on your energy bill. The EU Energy Label can be found on all refrigerators, laundry appliances, dishwashers, electric ovens and light bulb packaging. This label rates the energy efficiency of the appliance on a scale from G to A (A being the most efficient). Not only are A rated appliances cheaper to run, but they help reduce harmful carbon dioxide emissions which pollute our environment.